A Russian Mi-17 transport helicopter landing in Kandahar during trainig by US Air Force soldiers in southern Afghanistan. Moscow plans to sell helicopters on a commercial basis to NATO in support of International Security Assistance Force (ISAF) operations in Afghanistan. Sources within the Russian aviation industry indicated that the Alliance is interested in procuring civil transport helicopters to enhance prompt and safe troop and cargo movements in theater. 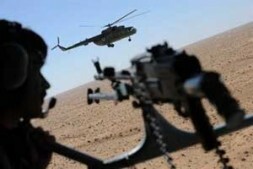 Mikhail Dmitriyev, the Director of the Federal Service for Military-Technical Cooperation (FSVTS), confirmed that NATO representatives have shown interest in the supply of Russian helicopters to Alliance forces in Afghanistan, although this appears to be in its initial phases. Dmitriyev noted that consultations are likely to continue early next year, after which he hoped that following preliminary agreements talks will begin with specific Russian companies (Interfax, October 29). On November 3 Vyacheslav Dzirkaln the Deputy Director of FSVTS said that large-scale delivery of Russian built transport helicopters could soon commence. He explained that this might also involve contracts with NATO member states on a bilateral basis to upgrade platforms to NATO standards. This boost to NATO-Russia cooperation over Afghanistan is rooted in reported shortages and operational challenges in relation to helicopters. "There is some evidence that European and American helicopters are not so well suited to operating in such difficult climate conditions," he explained. A number of NATO members and the Afghan National Army (ANA) use Russian manufactured aircraft in the country, while they have reportedly demonstrated high quality in terms of reliability and endurance combined with the ease of maintenance in mountainous terrain or severe weather conditions. Dzirkaln, referring to the sanctions imposed on Rosoboroneksport by the U.S. State Department during the presidency of George W. Bush, said that although current negotiations do not include military transport helicopters, if these sanctions were lifted it might stimulate such cooperation (Interfax, November 3). On October 28, Dmitriy Shugayev the Deputy Director of the Rostekhnologiy (Russian Technologies) corporation attended a conference in Brussels for the heads of rear services in NATO countries. During his presentation Shugayev highlighted the difficulties facing the Alliance in supplying helicopters in Afghanistan and that according to the European Defense Agency nine Eastern European ISAF members have "about 400 Russian made helicopters in service," and many will be used in Afghanistan. As well as confirming the potential to cooperate in this key area, he suggested that Moscow might also offer to train crews in Russian service centers (RIA Novosti, October 28). Although this support might be restricted to civil aircraft, Moscow is clearly considering possible military transport helicopters as another mechanism to deepen its cooperation with NATO in Afghanistan. Indeed, such cooperation will dominate the forthcoming NATO-Russia Council in Brussels on December 15-17. Last month, the Russian Ambassador to NATO Dmitry Rogozin told NATO Secretary-General Anders Fogh Rasmussen that Moscow is keen to learn the aims of the new U.S. strategy in Afghanistan and that the Alliance should make practical proposals on future cooperation. Ragozin noted that Russia currently assists NATO in the transit of non-military cargoes for ISAF through the northern distribution network (NDN), participates in joint efforts to train anti-drug personnel, and "is ready to assist ISAF, especially in the fields where they experience a severe shortage of military-technical support, such as air transportation and helicopters" (ITAR-TASS, October 28). Dzirkaln explained that cooperation between Russia and NATO has entered a new phase, involving Moscow moving beyond bilateral cooperation with individual members and entering "directly into concrete interaction with the structural subdivisions of NATO." Specifically, this relates to upgrading Russian built platforms among NATO's East European members. He added that a common NATO program for adapting Soviet and Russian weapons and equipment to Alliance standards might expand (ITAR-TASS, October 28). In exchange, Dzirkaln singled out France among the NATO countries with which Russia is successfully developing military-technical cooperation. "In particular, we purchase thermal vision devices for some types of weapons and military hardware from French companies. Thus, we buy from France onboard equipment for the Su-30 fighters supplied to India and Malaysia," Dzirkaln recalled. He highlighted French interest in the Krasnopol guided high-precision munitions systems developed at the Tula Instrument-Making Design Bureau, and clearly the ongoing talks on the possible Russian procurement of the Mistral class helicopter carrier is an example of growing naval cooperation. Over the past five years, work was conducted on a bilateral basis with France and Germany in the development and construction of a Mi-26 (Halo) transport helicopter, which included demonstration flights by French pilots. However, this only resulted in Paris and Berlin submitting reports to the relevant NATO committee. Moscow recognizes that such decisions are required at NATO level (Interfax, November 3). Equally, domestic factors are also at play. On November 2, the Russian Deputy Prime Minister Sergey Ivanov told a meeting of the military-industrial commission in Moscow that the lack of domestic serial production of helicopter engines represented a major problem: "The majority of Russian helicopters are equipped with engines made in Ukraine... about 250 engines per year," Ivanov said. Despite this being raised three years ago, Ivanov complained that a solution had been "delayed unjustifiably" (RIA Novosti, November 2). Ivanov also identified that another important task is eliminating the technology lag in onboard electronic instruments and precision weapons, which hinders the all-weather and 24-hour capabilities of Russian-made helicopters. He said that "the existing pool of helicopters and state aviation is morally and physically obsolete to a considerable degree. In army aviation, modern helicopter systems account for less than 10 percent." Surprisingly, he also revealed that the same situation exists in the aviation of the Federal Security Service (FSB), interior and emergencies ministries. He told the commission, however, that helicopter production had doubled in the past three years, reaching around 200 helicopters in 2009 (ITAR-TASS, RIA Novosti, November 2). Since ISAF supplies are now intertwined with Russian air and overland access through the NDN, such military-technical cooperation appears realistic. It suits Moscow's interests, accessing NATO countries and Alliance level programs to expand its export market and gain vital quid pro quo advanced western technologies urgently needed for its own airpower modernization. Moreover, by offering helicopter-based assistance, Moscow is not only plugging a niche in NATO operations in Afghanistan, but inadvertently recognizing that the Alliance will be there for the long haul and its success is also in Russia's national security interest.